Lots of people have memories locked away on old, deteriorating media: home movies, audio and video tapes, printed photos, negatives and slides. Even young people who never use film or tape themselves may have inherited these precious, but fragile, assets from parents and grandparents. It can be a huge hassle to transfer such material to a modern, digital format that can be viewed, played and easily shared with others. Now, a small company in Omaha, Neb., called PeggyBank.com, is offering a service where you send in all your old media (it will even provide the boxes) and the company will convert all of these items, for a fee, into digital formats and upload them to a free online “vault,” usable from any computer with Web access. This vault can be accessed anytime from any leading browser and can grow to any size. Plus, you can share access to some or all of the contents of your vault with others, or post items to Facebook and other social networks. I’ve been testing PeggyBank with a variety of my own old media—old print photos and aging video and audio tapes—and have been pleased with the results. I can now view these items, many featuring relatives and friends who have died, on my PCs and Macs and have been able to share them with others, who can either view or download them. The price of the conversion wasn’t trivial, but to me, the value has been greater. 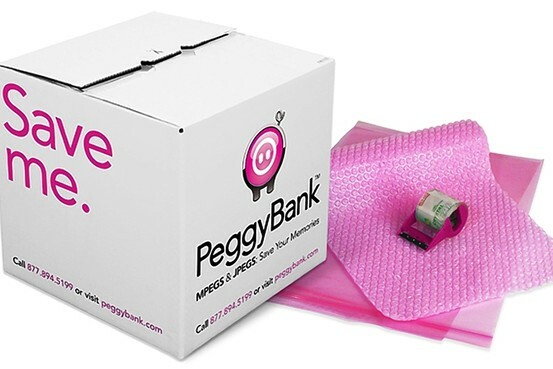 PeggyBank sends you a box complete with packing materials and tape. I shared the online PeggyBank version of an old family videotape, which had been created decades ago from even older home movies, with my brother by just emailing him a link to it. He said he “got a chill” viewing it on his PC. For years, many companies have offered services that convert old media, primarily to DVDs. Most, if not all, will optionally upload your converted content to the Web. But I chose PeggyBank for this review because it is squarely focused on online storage. It will deliver your content on physical devices like DVDs or flash drives, for a modest extra price. But its primary focus is the online vault. But overall, I can recommend PeggyBank, whose name is a play on both “piggy bank” and on the names of the most common digital video, audio and photo file formats: MPEG and JPEG. Here is how it works. For $20, PeggyBank sends you a box complete with packing materials, packing tape, waterproof bags and a label for free FedEx ground shipping. Or you can use your own box and shipping. When the conversion is done, it ships your original materials back. While the online storage is free, the conversion isn’t. The company’s price list, available at http://bit.ly/ReOsoD, is straightforward. For instance, each videotape or DVD you send in costs $13 to convert; each photo smaller than 8×10 inches costs 45 cents; each slide or negative is 49 cents. Silent film varies by the diameter of the reel, ranging from $10 to $80 per reel. Film with sound costs $20 per 50 feet. There is no charge for uploading the resulting digital files to the online vault. The company offers editing services at an extra hourly fee. Otherwise, it just digitizes the material in the form it gets them. So if you have cobbled together many out-of-sequence events on tape or film, they’ll appear that way in your digital vault. Users can post the contents of their vault to Facebook and other social networks. You can’t yet edit the resulting files within the vault Web page, though the company says it is planning such a feature. Still, you can download the files and edit them on your computer using your favorite software. You can’t add your own digital files to the vault; it isn’t meant for general storage. For my test, I sent PeggyBank six VHS video tapes, 10 old photo prints and 10 audiotapes (nine of them reel-to-reel.) The conversion of all this stuff, which was successful in all cases, was $272. I ordered the optional DVDs and flash drive, which added another $120. The quality was surprisingly good, considering the photos had faded, the audiotapes were warped, and the video tapes had been created from old home movies decades ago by another company. PeggyBank isn’t a restoration service and doesn’t promise to improve your material. But the company says its technicians will do their best to fix obvious problems. In my case, the video lighting was sometimes poor, and there were specks on some photos, but these problems were present on the originals. I was able to download and share the items easily from the vault, and copy the files to my computers from the optional flash drive. PeggyBank says the vaults it creates are housed on the servers of a large outside vendor, and backup copies are kept. My biggest problem with PeggyBank is the user interface for the Web page presenting your vault is a bit confusing. It wasn’t obvious how to get back to the previous item. And the third-party mechanism PeggyBank uses for sharing via email, while it worked, was crude-looking. 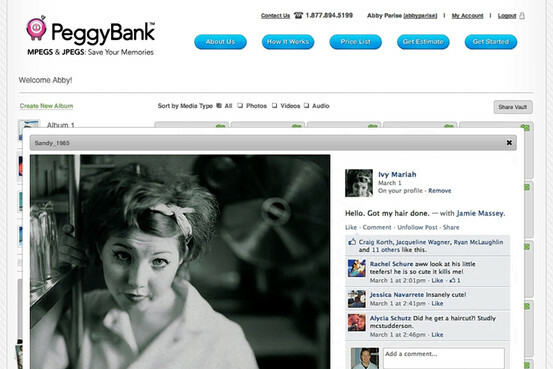 Still, PeggyBank is a good choice for dragging old memories into the Internet age. It liberated my old, decaying, media and made them almost as easy to view and share as photos and videos captured this morning on a smartphone.